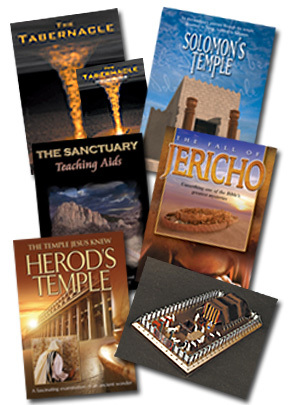 Explore the ancient history of the Old and New Testaments with these fascinating DVDs and learning resources: The Tabernacle, The Tabernacle Student Workbook and The Tabernacle Model Kit, Solomon's Temple, The Sanctuary Teaching Aids (DVD), Herod's Temple, The Fall of Jericho. An extraordinary journey through the temple, promised to David, fulfilled in Solomon. The place where it was built in ancient times was considered the center of the world. In many ways it has continued to be a center of history. Today it continues as a center of great reverence as well as great conflict. An understanding of the Temple in Jewish life and history is essential not only to understanding the Bible but also history and current events in Jerusalem today. This program gives a basic introduction to the colossal achievement of Solomon's Temple and details its design, construction, meaning for Israel, and what went on there and why. Solomon's Temple was destroyed in 586 B.C., but through the use of modern computer graphics, the Temple is reconstructed visually to provide a contemporary experience of its ritual, beauty and grandeur. A comprehensive 53-page student workbook to accompany the Tabernacle video. Discusses various aspects to the tabernacle; sanctuary, dwell, entrance, altar, wash, sacrifice, blood, examine the evidence, acknowledge your need, holy place, lampstand, light, bread, incense, curtain, most holy place, priests, covenant, and presence. Each section contains understanding, applying, exploring, meditating, and additional thoughts. • 17-minute instructional DVD using the latest animation and special effects. Enter the Sanctuary with the High Priest and discover its mystery and beauty! Jerusalem, rich in historical and Biblical heritage, is the home of the Temple Mount, one of the world's most recognizable and visited sacred sites. Now, travel back in time to see it the way Jesus and his disciples did over 2,000 years ago. They knew it as Herod's Temple. We remember it as the Temple Jesus knew. Imagine the scene as Jesus expelled the moneychangers from its outer court and as the veil of the temple leading to its holiest chamber was torn at the time of Christ's crucifixion. - Music by Steven Bias from "Herod's Temple: The Temple Jesus Knew"
- PDF handout: Guide to the people and places of "Herod's Temple: The Temple Jesus Knew"
he fall of Jericho is a well-known story, fascinating children and adults alike. But what really happened there thousands of years ago? Did God work a miracle to bring down the walls of Jericho as the Bible says? Or can natural causes sufficiently explain the city’s demise? The answers, previously buried under rubble and dirt for three and a half millennia, are now being uncovered. But are there enough pieces of the puzzle remaining to solve the mystery? Actual Model to be put together. NO VIDEO INCLUDED. This model is a miniature representation of the Tabernacle in the Old Testament. The model includes each of the pieces used in the Tabernacle as described in the Bible. It is a good resource for churches, schools, or even for family night. It is a wonderful way to have fun, and at the same time learn from God's Word. Model dimensions: 22" X 12 1/2"